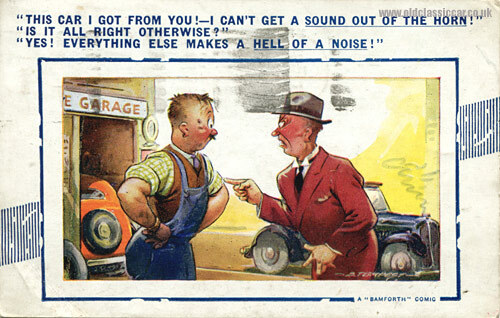 Funny and/or comic postcards with a motoring theme to them. 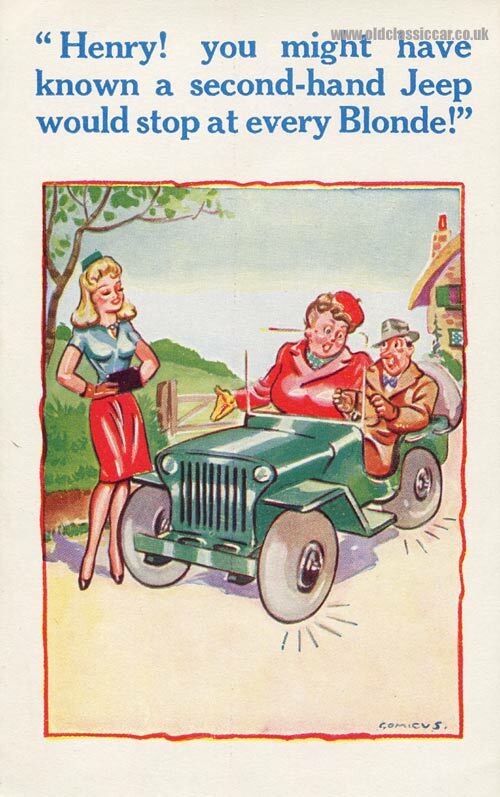 Humorous postcards with a motoring theme - Page 1. I have featured some of these postcards on another website, but they are so good I didn't see any harm showing them here too. 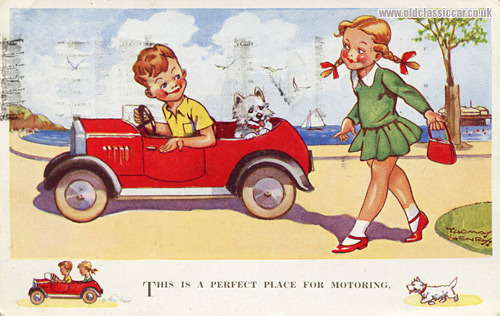 Some postcards are pre-war, and others are from the 1940s and 1950s, so fit in perfectly with the vintage and classic car themes of oldclassiccar. 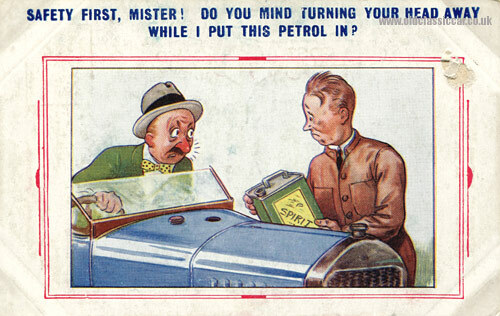 See the motoring humour section when you've finished looking at these postcards. Also see Page 2 of this section for more amusing postcards. 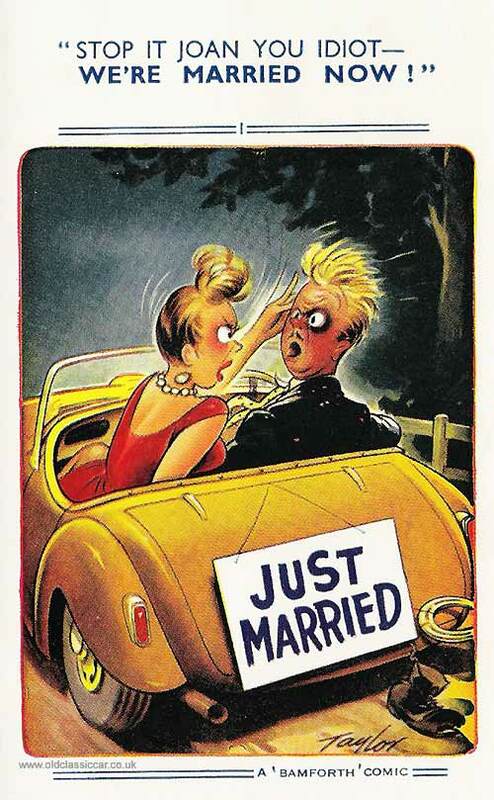 And another Bamforth "Comic" postcard yet again showing a couple in a motorcar, this time on their own. En route from their wedding judging by the "Just Married" sign hanging on the back of this open car. 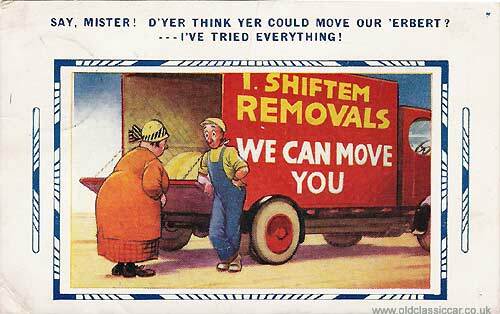 An earlier Bamforth "Comic" postcard now, this one is franked August 1932, and shows a rotund lady speaking to the driver of this removals van, owned by I. Shiftem Removals. Nice old lorry, note the circular door glass! There are no clues as to who published this humorous postcard, probably in the 1930s. 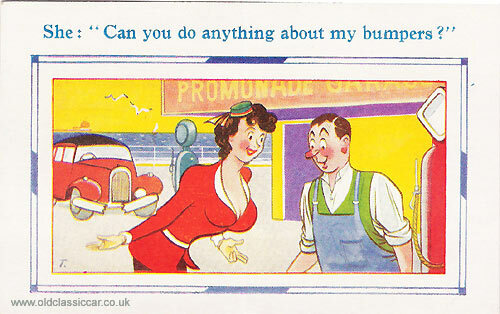 It shows a garage owner (note the period petrol pumps behind) being approached by a well-endowed young maiden who is having a problem with her, errr, 'bumpers'. 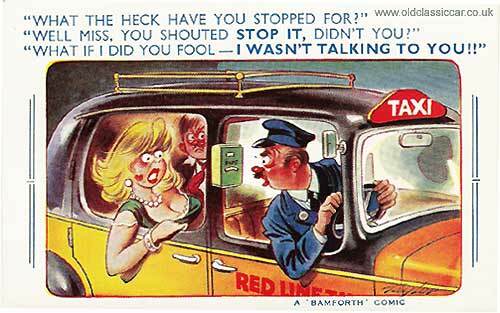 Two more Bamforth postcards now - the first, shown above, has an August 1945 postmark on it and is numbered 208 in the company's "Comic" series. Evidently the gent to the right is less-than-enthused about the condition of the car he'd recently bought from the oily garage mechanic. While the postcard isn't in perfect condition - something many collectors are understandably fussy about - I still think it's great. Interestingly there is a quote from the Prime Minister no less, printed on the reverse, a reminder of the wartime conditions that the Brits and many of her allies were to endure for some time to come - "Let us all strive without failing in faith or in duty". Numbered 2070, this Bamforth postcard probably dates to slightly more recent times than the 1945-franked example shown previously. The style of text on the reverse is also different. The mechanic, preparing to empty the contents of a two-gallon motor spirit can into his customer's car, is concerned about the proximity of the car owner's glowing nose to his highly-flammable petrol. Very different is this attractive postcard, dating to 1948 and produced by Valentine's, one from their "Jack, Jill and Jock" series. A young lad - Jack I assume - is shown in his pedal car, accompanied by the dog named Jock, while poor old Jill has to make do with walking. This postcard was purchased on the Isle of Man, and posted to a family on the Wirral. Sticking to the theme of WW2, this next charming offering was sent by a serving British soldier out in Europe to his son back home. It is un-dated and bears no address, so my guess is that it accompanied a letter within an envelope, the postcard being destined for his son. The illustration is of a "junior" soldier speeding along on a motorcycle combination, while two equally youthful young ladies gaze at him admiringly. The paragraph of French text refers to the soldier enquiring of the young lady whether a kiss might be in the offing. 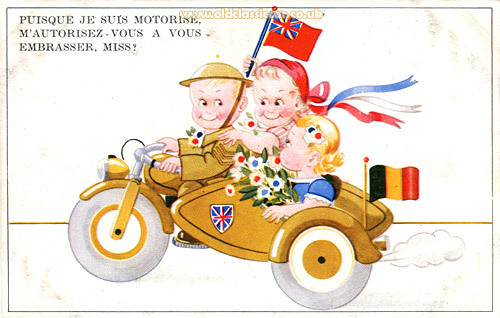 The sidecar bears the Belgian flag, while one of the girls grips tightly to the Red Ensign, a flag more commonly seen on British Merchant Navy vessels. Quite what it's relevance here is I'm not sure? While not all of the handwriting on the postcard's reverse is legible, the gist of the message from a dad to his lad reads as follows. The reference to having left Holland, and the Belgian flag on the sidecar, suggests that he was part of the push taking place by the Allies in that area during 1944, although the reference to snow having cleared may point to a date for this postcard being early in 1945. My dear son, here is another PC to add to your ever growing collection. I hope that mum & you are in good health ... all the snow has disappeared and the roads out here are terrible, had some rain today and it did not help matters ... Still busy as usual. I'm not in Holland any more. Well it is about bedtime so will say Goodnight & God bless mum & You ... Your loving dad. It's a shame that no more is known of the sender or of the card's recipient, they must have missed each other. If this small item of memorabilia could talk I'm sure it'd have an interesting tale to tell.